One of the most important variables in defining the sound of a guitar is the wood used to build it. Generally speaking, the tonal impact of the various tone woods used by guitar builders will be the same for any given body shape. The following is my attempt to describe the woods I use and their effect on the tone (and appearance) of the instrument. Other than the species, perhaps the greatest variable is that no two pieces of wood, even of the same species, will sound the same. Thus, any descriptions are averages, not guarantees about the sound of a given guitar. 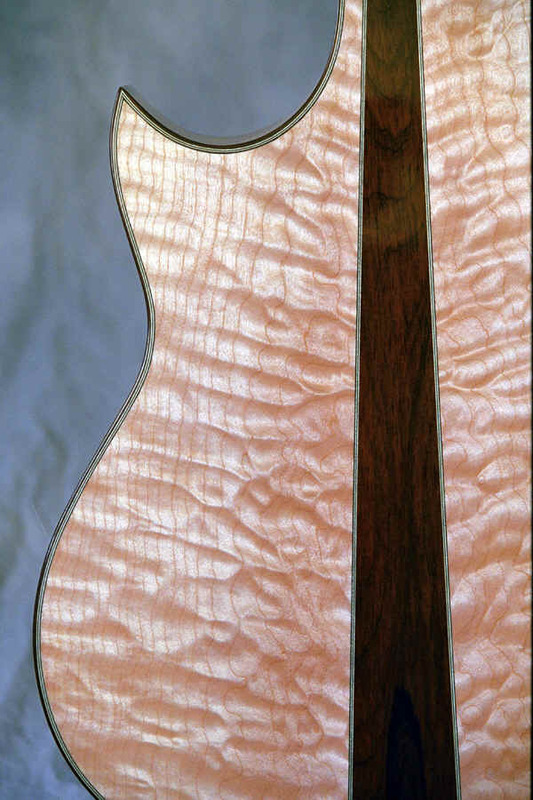 Of course, another variable in the area of guitar woods is the quality of the woods, which includes appropriate cutting, careful aging and consideration of appearance factors. And of course the greatest variable of all, overwhelming all others, is the builder. I will try to describe a little about these factors as well. 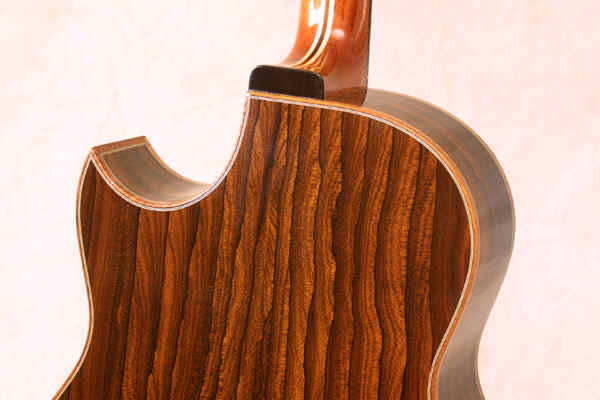 If you want to read more about different woods and their tonal qualities, look at the current catalog of Luthiers Merchantile (see links section) which has a number of "essays" from various makers. Ultimately, the only way to know how a guitar will sound is to play it. A few thoughts about how we think about tonewoods. Wood is often described as having fundamentals, which is the immediate and most obvious sound of the instrument, and overtones, which tend to add to the complexity of the sound. A player who seeks a wide dynamic range and strong clear tones will look for strong fundamentals, and a player who plays at softer volumes with less dynamic range will appreciate complex overtones (Generally speaking). AGING AND DRYING: One of the great mystiques in luthiere is that the wood we use must be old, and naturally aged at that (i.e. air dried). This is not entirely a myth. Instrument woods must be dry. If wood has not reached a comfortable moisture equilibrium with the environment it lives in it may shrink or swell over time. This problem is worse when the guitar is placed in different conditions. The greatest danger is shrinkage from wood placed in a very dry environment, or which is insufficiently dried. Either condition will inevitably lead to cracks. Whether it is better to air dry wood, as opposed to kiln drying , is a more difficult question. Kiln drying is quicker, and therefore, cheaper. I suspect that properly done kiln drying is as good as air drying, but it is quite possible to do it wrong, with a number of serious problems. As a result, most builders look for air dried wood, but at the same time, most of the wood out there is kiln dried. The compromise I use is to try to have 3 or 4 years of wood in stock at all times so that the wood I use at any given time has been air drying in my shop for at least three years. This should ensure wood that is up to my standards. QUARTER SAWING AND RUNOUT: Both of these factors are a result of the way in which the wood is cut. Quarter sawing means just that -- the log is cut to length (usually blocks of about 24") and then cut (or preferably split) into quarters (called billets), and the boards are then sawn off the resulting flat sides. The result is (hopefully) wood in which the grain lines are vertical to the surface, or close to it. This works better in wood like sitka where the trees are very large and less well in wood like red or Appalachian spruce where the trees now available are often quite small. Runout refers to another form of grain, which must run parallel to the flat plane of the wood. This is best achieved by splitting billets out of the log, rather than cutting them. Both of these conditions are highly desirable, even essential to quality instruments. In brief, they contribute to a high strength to weight ratio. This is important since strength is necessary to resist the pull of the strings and weight (mass) is an "evil" as it will dampen the tone of the instrument. Fortunately, there are now a good number of suppliers who are very knowledgeable about how to cut guitar wood. As a result, the quality available today is the best it has been in my career. NOTE: Some of the photos on this page (those with a border) are thumbnails - click on them to see the full size photo. 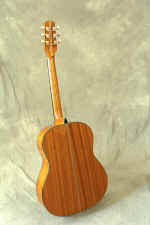 SPRUCE: The top or soundboard of the vast majority of instruments are made from some species of spruce. These woods possess many admirable qualities: Resonance, high strength to weight ratio, easy workability, and others. 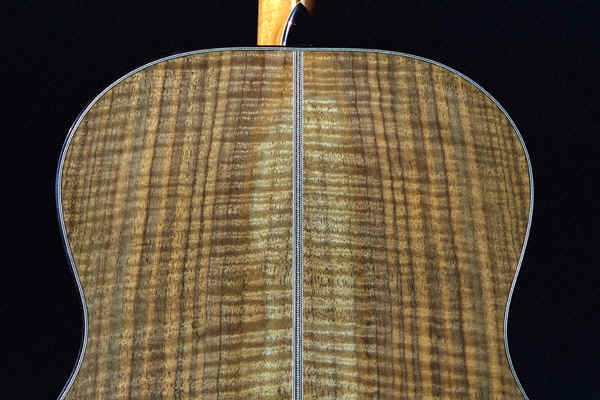 For many years the "premium" spruce was German or European spruce, which is still widely used in classical guitars. 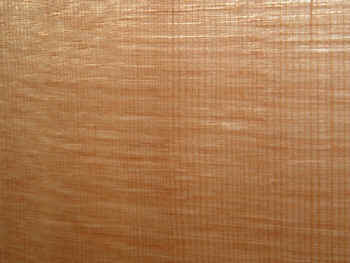 German Spruce has a rich warm sound well suited to classical guitars. However, this wood is now in short supply, and alternatives are often used. Appalachian Spruce: In the first half of this century many American makers, like C.F. 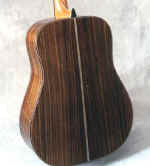 Martin, used red or Appalachian (or Adirondack) spruce. My impression is that red spruce has a sound very much like the best sitka - very strong, resonant and penetrating with a bright crisp sound. It often has more overtones and thus will have a fullness and richness of tone combined with good dynamic range. This wood is also now very hard to obtain, and very expensive. It also generally does not have the fine appearance of good sitka. 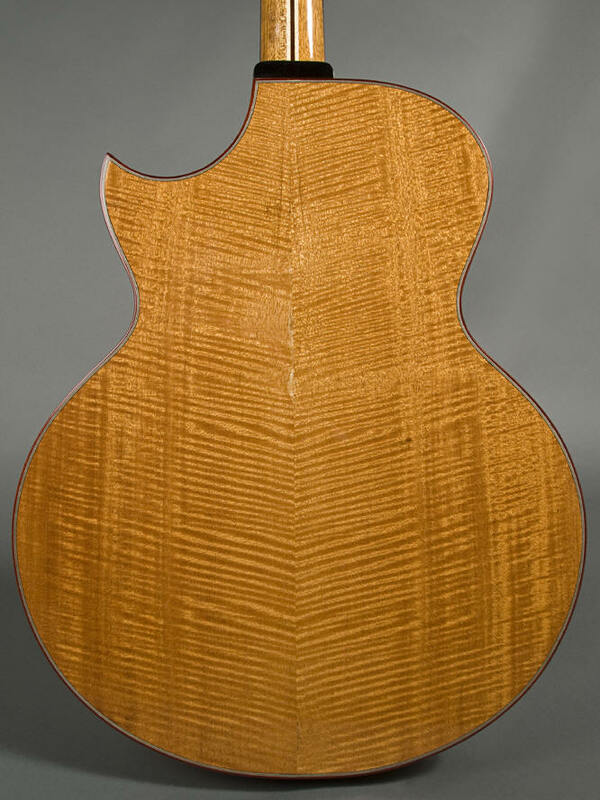 German Spruce: This is the traditional wood of classic guitars, and like Appalachian spruce, is very hard to obtain, and often not of the quality of other spruces. Good German spruce will be similar to Engelmann - with good overtones and a very light color. A rich sounding wood but perhaps less clear when played at loud volumes or wide dynamic range. Engelmann Spruce: This wood, found in the United States and Canada, is lighter in weight and color than sitka. It is almost white. It is not as stiff as sitka, and tends to be a good guitar for the lighter player who likes the complex, rich tones it produces. It is less well adapted to the heavy playing styles. Sitka Spruce: The most common spruce these days is sitka, which comes from the west coast of the United states and Canada. Because it is still plentiful and the trees are huge, it is still possible to get wonderful sitka spruce. I love the sound of sitka spruce -- it makes a very strong, loud guitar which has a balanced resonant sound with good sustain. I feel that it is a wood with a very wide dynamic range. Sitka shows a very strong tendency to improve with age, perhaps more than other woods. Cedar: Some makers, particularly classical builders, have begun to use western red cedar (my friend and fellow twin citian, Jim Olson, also uses a lot of cedar on his steel string guitars). I have made a few guitars with cedar and understand its attraction. It makes a very rich warm guitar with good definition, and a very immediate sound. It is generally not well suited for vigorous attack and wide dynamic range - it can get muddy if driven too hard. While some say that it does not age as well as sitka, it may be simply that it starts out sounding aged. My only real complaint is that it is a very soft wood and will dent or nick very easily. This is not a major complaint - I have no reason to think it will not have the longevity of other woods. MAHOGANY: Mahogany is a wonderful wood. It is strong, stable and resonant. When used for bodies (i.e. back and sides) of guitars it has often been seen as a "cheap" wood, an entirely undeserved reputation. Mahogany guitars have a bright penetrating sound which works particularly well for playing with other instruments. 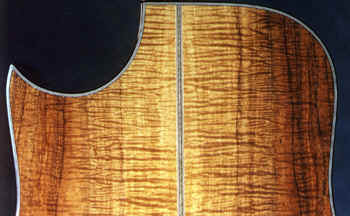 Mahogany has a sweet "woody" tone that is good in trebles and bass, and perhaps a bit weaker in the mid range. and I use an "African" mahogany called sapelle, which has a very similar sound to the south American mahogany and a beautiful ribbon or stripe figure. (Looking at my choice of adjectives in this section might give the impression that I am mildly nuts about wood -- and that impression is true). When used in necks, the other major use of mahogany, its chief virtues are strength and stability, which help keep the neck from warping. 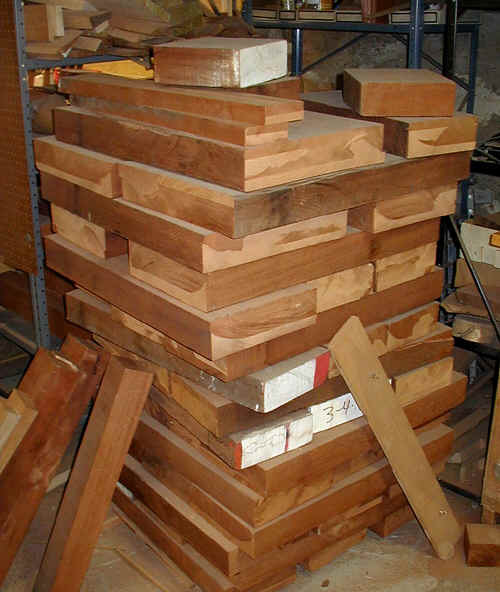 I do use Honduras mahogany (not African) for necks and end blocks. Another shot of the mahogany which I use. Occasionally south American mahogany comes with a lovely flame figure. My stash of neck wood. 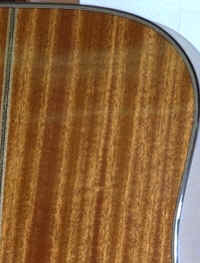 ROSEWOOD: The traditional and most revered wood for guitar back and sides is Brazilian rosewood. This wood has a beautiful rich variety of brown and purple colors in it, and makes a warm rich sounding guitar with great resonance and volume. However, Brazilian rosewood is no longer available in commercial quality or quantity. As a result it now sells for astronomical prices, and the quality (see quarter sawing, above) is often marginal. My ear does not seem acute enough to hear a significant difference between Brazilian and Indian rosewood. Those who can distinguish a difference say that Brazilian has better clarity in the bottom and a almost bell like tone in the trebles. 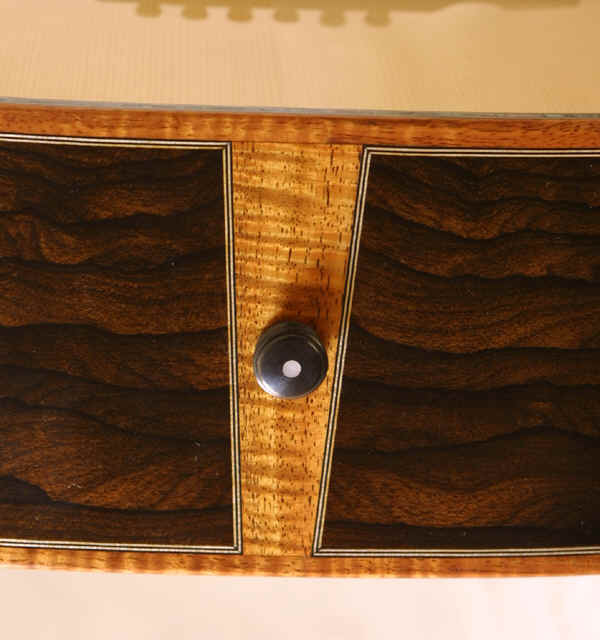 While I love this wood, I have reluctantly come to believe that it is not a good investment for new guitars simply because of the very high cost.. Its principal purpose is for collectors who wish to create an instrument reminiscent of the past. 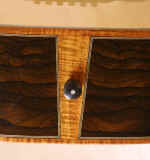 I do have a small supply of Brazilian rosewood and there are photos of some of it HERE. recently some of the suppliers are shipping in Brazilian Rosewood which was cut from stumps left over from old logging. this wood is "legal" in that no new trees were cut. Some of it is very nice. If the rumors of its continued availability are true, this may be a fine new source of good wood. Indian rosewood has become the general substitute for Brazilian rosewood. Generally speaking, this wood is not as attractive as Brazilian (to my eye, at least). It has a decidedly purple color and the grain markings are coarser. Still, it is a beautiful wood, and, to my ear, sounds virtually the same as Brazilian. Some makers and musicians tell me they can hear the difference. Even they will admit that it is not a substantial difference, and I wonder if the difference is largely due to the fact that most Brazilian rosewood is in old, and thus well aged, guitars. Indian rosewood has two added advantages: it is less prone to cracking (a big problem in Minnesota) and it is grown in a sustainable fashion on plantations, which makes it environmentally superior. It is also affordable, although prices have gone up about 30% in the last year. KOA: Koa comes from Hawaii, which automatically means that it is in short supply. It is, however, a beautiful wood (my absolute favorite). It comes in a variety of rich golden colors, from light to dark, and often with very strong grain markings, which are beautiful. It very often comes with a very high degree of flame or curl which, in extreme cases, are so intense as to defy description. (I see no evidence that the degree of figure has any effect on the tone of the instrument.) 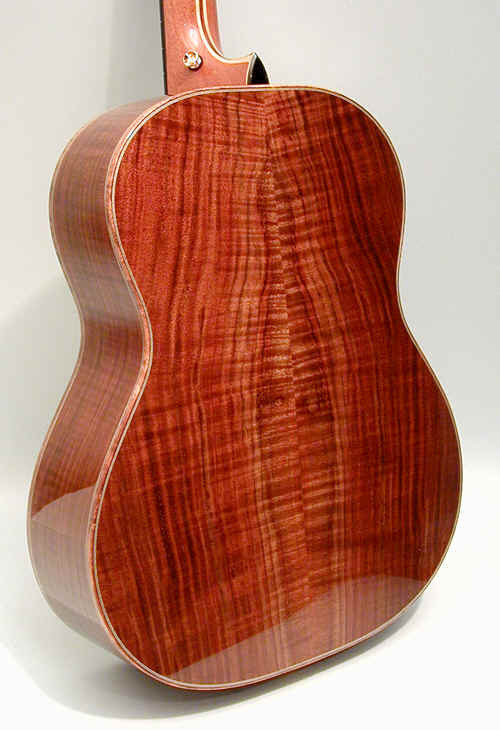 Koa makes a very balanced sounding guitar -- much of the warmth of rosewood and much of the brightness of mahogany. Some builders feel that Koa is variable in its tone. I have not found this to be true or a problem. My absolute favorite wood for guitars, particularly the concert size guitars. The very high quality wood is very expensive (although not as much as Brazilian Rosewood). Although it is in short supply, and very costly, there is some evidence that it is now being grown in plantations, and may be available for the long term. Another nice piece of Koa!! 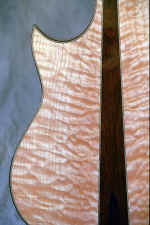 MAPLE: I have made a few guitars of highly figured maple - which makes a beautiful guitar. Maple guitars tend to be very bright and penetrating. If combined with a top wood such as Engelmann spruce, it can give a nicely balanced guitar. This photo is a piece of "quilted" maple -- click on it to see a larger photo of the maple I have used recently. Recently I have been using western big leaf maple - a somewhat different species from the eastern hard maple traditionally used by companies such as Gibson and guild. this is a softer lighter wood, but with a fabulous figure. Presumably because of the softer nature of the wood the sound is a warmer more balanced wood - I have become very fond of this wood. This is walnut. A relatively new wood for guitar makers (and me) but one that has worked very well. Walnut seems to sound very much like Koa. It has some of the warmth of rosewood and the crispness of mahogany. This is Ziracote, a wood from Mexico. I recently finished a guitar made with this wood - it is lovely. This is a very dense wood, and the sound is very much a rosewood sound. 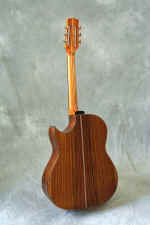 The Ziracote guitar has Koa binding and end wedge. A nice piece of walnut. I have recently started using cocobolo, a true rosewood coming mostly from Mexico. 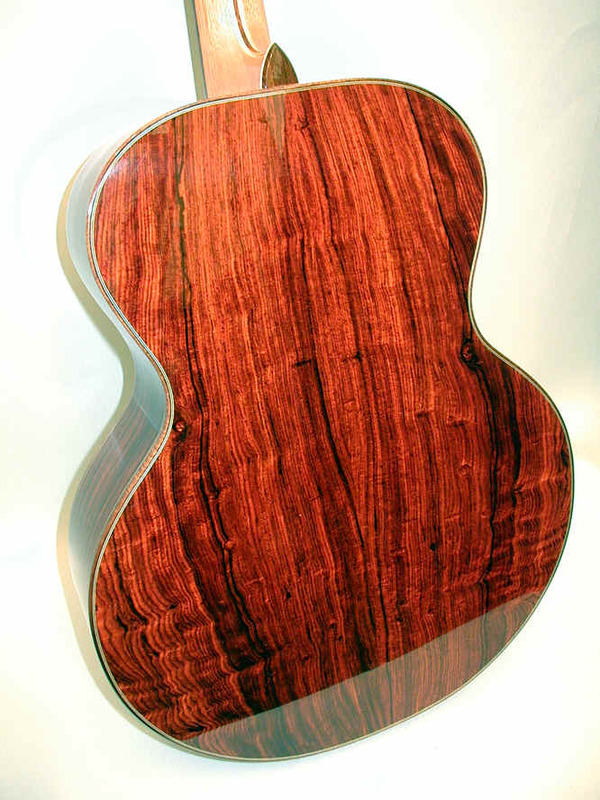 It seems to have much of the tone of true Brazilian Rosewood - a brightness or shimmering quality. Very nice and extraordinarily beautiful.